I’ve officially started my adventure round Europe! 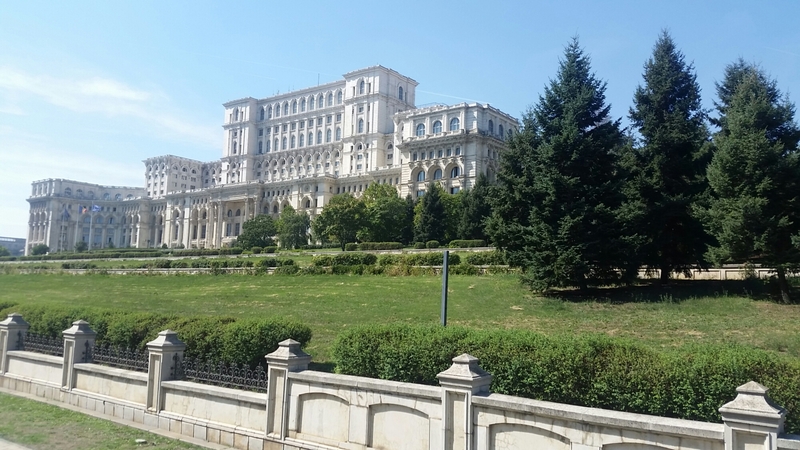 It was a long start too – I got up in England at 4am and finally crashed out at my friend’s house in Bucharest around midnight. I’m lucky enough to be bookending my trip with visits to European friends (both here and in Paris) so I have nice, central apartments to stay in. Here in Bucharest I’m visiting my old shipmate Andreea, who I haven’t seen in months. I’m glad to have started the trip staying with a friend because it immediately erased any stress about getting here as I knew I had airport pick up and I was going to be well looked after! So far I’m two days in. On the first day we took a city bus tour so I could see the sights and get my bearings, and then in the evening we walked around Old Town and had a few drinks before going to a big Freddie Mercury memorial concert. I love the traditional architecture here. It’s so gradiose. Unfortunately much of it needs restoring, but even the buildings that have damage have a melancholy beauty to them. Parts of the Old Town have been done up a little, as bars, restaurants and hostels snap up the cheap buildings. It’s a bit odd to see such dichotomy crammed together in the narrow streets. It’s really popular with younger people and when we finished our drinks at 9, the streets were already heaving. Some of the Old Town bars. Today we went to the Palace of Parliament. If I thought the old buildings with the new bars were juxtaposing before, that was nothing. The Palace of Parliament is the very definition of opulence. It’s the second biggest building in the entire world (after the Pentagon in the USA) and although it has an official cost of $3 billion, our guide said it more likely has a very roughly estimated cost of $6 billion (basically, no one really knows). Work began in 1984 and has continued on and off ever since. The building reportedly took 700 architects and 20,000 builders working on a round-the-clock rotation to complete (well, almost, it’s still not finished), with all the materials sourced from Romania. Everything about the building is over the top. It has over 1,000 rooms, and to keep them clean over the course of a year takes a reported 1 million euros. Every single room and hallway is absolutely stunning and meticulously decorated so every handmade rug, curtain and radiator cover match in theme or colour. 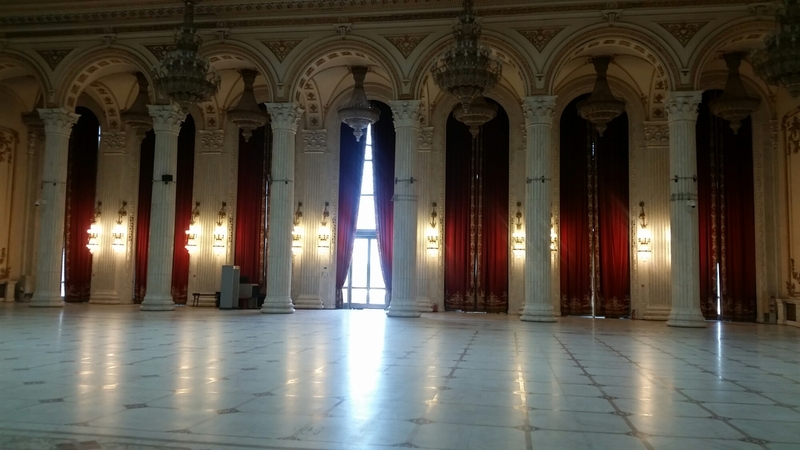 Every floor is geometrically designed to reflect the huge chandeliers on the ceiling. And the chandeliers! According to our guide (you can’t visit without one) if every single light was kept on the electricity bill would be equivalent to that of a city populated by 100,000 people. Another incredible part of the tour was the view from the terrace and the roof. You can see for miles in all directions, the city sprawling out as far as you can see. It does seem ridiculous standing on such a pile of wealth when so much of the city isn’t maintained, and I think that is a very common opinion. Our guide pointed out a huge church near the building that is only half erected; there were big protests by the locals over another huge, grand building being built when so much city maintenance is needed. Even so, I would still recommend a visit. 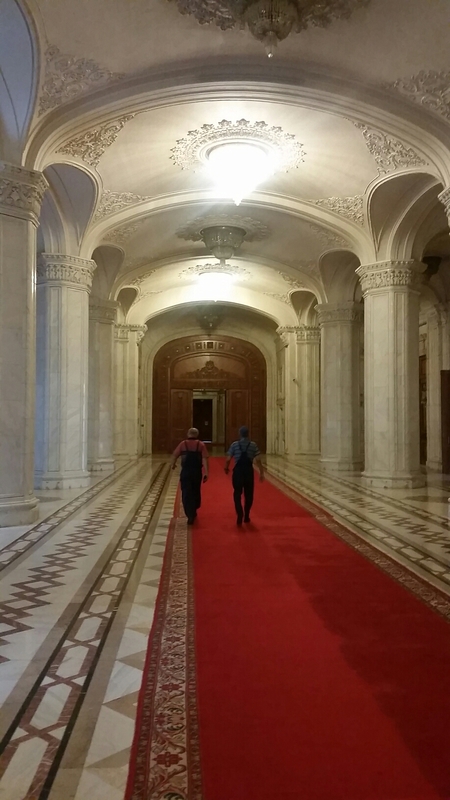 It was really interesting to learn of the recent Romanian political history, and the rooms are some of the grandest I have ever seen. You must book ahead though, as it is a functioning political administrative building, and be prepared to pay for the privilege of taking photos. I’ll post more pictures when I have access to a computer to upload my camera files, but for now these here are the ones I remembered to take with my phone! Just discovered this amazing blog! Have fun travelling! I am from Romania . I am happy that you like our country !!!!! I love it! I want to come back again next year and see the mountains and the castles!